Paula D. McCLain is Professor of Political Science, Professor of Public Policy, Dean of the Graduate School, Vice Provost for Graduate Education, and Co-Director of the Center for the Study of Race, Ethnicity, and Gender in the Social Sciences at Duke University. Steven C. Tauber is Associate Professor and Chair of the Department of Government and International Affairs at the University of South Florida. Measuring Equality: Who Was Eligible to Be Included in "We the People"? Measuring Equality: Whom Did the Framers Represent? Our Voices: Nonvoting Delegate Eleanor Holmes Norton and Representation for Washington, D.C. Evaluating Equality: Should the Race or Ethnicity of a Representative Matter? 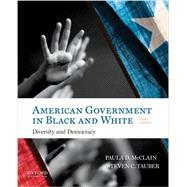 Chapter 10: Public Opinion: Divided By Race? Measuring Equality: Donald Trump, Barack Obama and the "Birthers"
Chapter 11: The Media: Reinforcing Racial Stereotypes? Evaluating Equality: Racial Bias in the Press Coverage of Hurricane Katrina? Evaluating Equality: What Arguments Did Supporters and Opponents of the ERA Put Forth? Social Movement or Political Activism? Our Voices: Senator Barack Obama's Speech on Race: "A More Perfect Union"